A protocol for the synthesis of bimetallic nanoparticles in ionic liquids and the procedure of their catalytic testing in the selective hydrogenation of unsaturated aldehydes are described. Dietrich, C., Uzunidis, G., Träutlein, Y., Behrens, S. Synthesis of Bimetallic Pt/Sn-based Nanoparticles in Ionic Liquids. J. Vis. Exp. (138), e58058, doi:10.3791/58058 (2018). We demonstrate a method for the synthesis of bimetallic nanoparticles consisting of Pt and Sn. A synthesis strategy is used in which the particular physico-chemical properties of ionic liquids (ILs) are exploited to control both nucleation and growth processes. The nanoparticles form colloidal sols of very high colloidal stability in the IL, which is particularly interesting in view of their use as quasi-homogeneous catalysts. Procedures for both nanoparticle extraction in conventional solvents and for nanoparticle precipitation are presented. The size, structure and composition of the synthesized nanocrystals are confirmed using inductively coupled plasma atomic emission spectroscopy (ICP-AES), X-ray diffraction analysis (XRD) and transmission electron microscopy (TEM) with energy-dispersive X-ray spectroscopy (EDX). By this, we show that the nanocrystals are random-type alloy and of small (2-3 nm) size. The catalytic activity and selectivity in the hydrogenation of α,β-unsaturated aldehydes is tested in a semi-continuous batch-type reactor. In this context, the bimetallic Pt/Sn-based nanoparticles reveal a high selectivity towards the unsaturated alcohol. ILs represent room-temperature molten salts of large organic cations with asymmetric substitution patterns. They are well known for their unusual physico-chemical properties. The IL properties can be tuned by different combinations of IL cations and anions, and by now, a plethora of ILs is commercially available. Recently, scientists started using ILs as reaction media for the synthesis of nanoparticle due to their modular and excellent solvent properties, low vapor pressure, high polarity and a wide electrochemical stability window1,2,3,4. During the past decade, bimetallic nanoparticles have attracted considerable attention because they show multiple functionalities and prominent catalytic activity, selectivity as well as thermal and/or chemical stability over their monometallic counterparts5,6,7,8,9,10. Due to synergistic effects, modified electronic and/or geometric surface structures, high catalytic activities and selectivities may be achieved for chemical transformations even if one of the constituents is less or even inactive11. Although the controllable synthesis of nanoparticles has developed rapidly over the recent years, there is still a need for more accurate control over nucleation and growth stages for the synthesis of bimetallic nanocrystals. Since different metals are involved in bimetallic nanocrystals, the atomic distribution not only influences the final nanoparticle architecture but also the catalytic properties. The catalytic performance is highly sensitive to the nature of atomic ordering (i.e., random alloys vs intermetallic compound) even if the composition and stoichiometry are exactly identical. It is surprising, that, so far, the attractive properties of ILs are less explored for the controlled synthesis of bimetallic nanocatalysts12,13,14,15,16. In this protocol, we will show how to exploit the unusual properties of ILs for the synthesis of bimetallic, random alloy-type nanoparticles. Here, very small nanoparticles with uniform sizes can be synthesized without the addition of auxiliary ligands at moderate reaction temperatures. Nucleation and growth processes are directly controlled by IL-inherent, weak cation/anion interactions. Several methods for Pt/Sn-based nanoparticles are known, however, these synthetic protocols typically involve either supports and/or stabilizing agents (i.e., rather strongly coordinating surfactants or ligands)17. Ligands/surfactants adsorbed on the nanoparticle surface may modify or even inhibit catalytic performance and often need to be successively removed (e.g., via thermal treatment) for catalytic application. This protocol yields IL-based nanoparticle sols of extraordinary high colloidal stability without the addition of such strongly coordinating ligands. Nanoparticles stabilized in ILs have revealed interesting properties as quasi-homogenous catalysts in a broad range of catalytic reactions18,19,20,21,22,23,24. In this protocol, the selective hydrogenation of an α,β-unsaturated aldehyde (i.e., cinnamic aldehyde) is described as a model reaction to probe the catalytic performance of the IL-stabilized nanoparticles and the influence of tin alloying on the catalytic activity and selectivity25. This protocol is intended to elucidate the details of the experimental synthetic procedures and to help new practitioners in the field to avoid many common pitfalls associated with the synthesis of nanoparticles in ILs. The details of materials characterization is included in previous publication25. CAUTION: Please consult all relevant material safety data sheets before use. Several of the chemicals used in these syntheses are acutely toxic and carcinogenic. Nanomaterials may have additional hazards compared to their bulk counterpart. Please use all appropriate safety practices when performing a synthetic reaction including the use of engineering controls (fume hood, glove box) and personal protective equipment (safety glasses, gloves, lab coat, full length pants, closed-toe shoes). The following procedures involve standard, air-free handling Schlenk techniques using argon as an inert gas or the use of an anoxic glove box. Assemble all glass-to-glass joints carefully with Teflon ring seals or vacuum grease to avoid contact with air. Inspect all glassware for defects prior to use. Triethylborane is a pyrophoric liquid which burns in contact with air. Please take care of appropriate safety practices and handle in air-free conditions. Please employ all appropriate safety practices for the use of hydrogen and any equipment (autoclaves, gas burettes) under high pressure. Suspend 34.5 g (0.873 mol) of potassium hydride in 400 mL of anhydrous tetrahydrofurane in a 1000 mL 3-neck round bottom Schlenk flask under argon atmosphere by using the Schlenk line and heat the flask to 50 °C while stirring with a stir bar. With a syringe, add the 100 mL (0.71 mol) of triethylborane drop-wise (~1 drop/s) to the stirring suspension of potassium hydride in tetrahydrofurane. 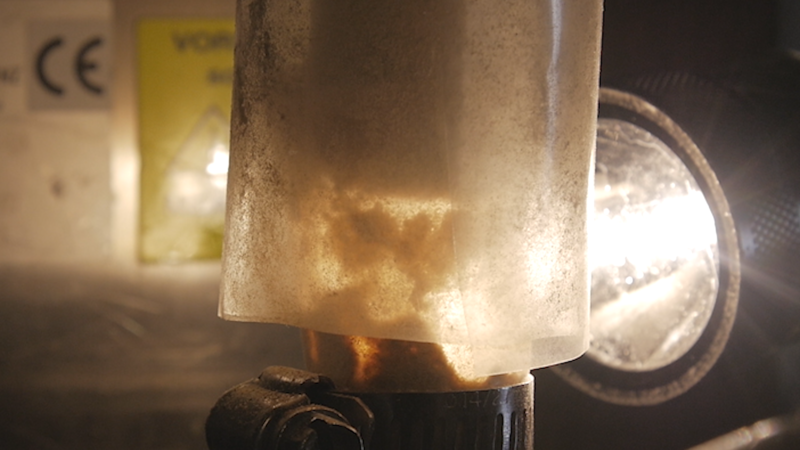 Cool the reaction mixture to -40 °C and remove any excess of potassium hydride by filtration. Receive potassium triethylborohydride as a clear, colorless solution in tetrahydrofurane. Under argon atmosphere, dissolve 50 g (0.11 mol) of methyltrioctylammonium bromide in 100 mL of anhydrous tetrahydrofurane in a 500 mL 2-neck round bottom flask. At room temperature, add 100 mL of K[BEt3H] solution (1.5 M in tetrahydrofurane) to the solution of trioctylmethylammonium bromide in tetrahydrofurane. Stir for 3 h at room temperature with a stir bar, then cool to -40 °C overnight. Remove potassium bromide via filtration of the cooled solution. Receive [OMA][BEt3H] as a clear solution in tetrahydrofurane. Prior to use, dry and degas the [OMA][NTf2] in vacuum (10-3 mbar) at 70 °C for 3 h and in vacuum (10-4 mbar) at room temperature for another 16 h.
For the synthesis of Pt/Sn nanoparticles (1:1 molar ratio of Pt:Sn precursor), suspend 33.2 mg of PtCl2 and 29.6 mg of Sn(ac)2 (or 23.7 mg of SnCl2, accordingly) in 4 mL of [OMA][NTf2] in a 100 mL Schlenk flask and stir with a stir bar at 60-80 °C for 2-3 h under the vacuum line. For the synthesis of Pt/Sn samples (3:1 molar ratio of Pt:Sn precursor), suspend 49.9 mg of PtCl2 with 14.8 mg of Sn(ac)2 (or 11.9 mg of SnCl2, accordingly) in 4 mL of [OMA][NTf2] in a 100 mL Schlenk flask and stir with a stir bar at 60-80 °C for 2-3 h under the vacuum line. Place the suspension in an ultrasonic bath at room temperature for 1-2 h.
At 60-80 °C, rapidly inject 3 mL of [OMA][BEt3H] solution (1.23 M in tetrahydrofurane) with a 3 mL syringe to the metal salt precursors in [OMA][NTf2] whilst vigorously stirring. The rapid injection creates a sharp nucleation event, promoting a small size and narrow size distribution. Let the reaction proceed while stirring at 60-80 °C for 2-3 h.
Cool to room temperature and remove any volatile compounds in vacuum during a period of 0.5 h.
Obtain the Pt/Sn-based particles as a highly stable colloidal sol in [OMA][NTf2]. Add 3 mL of anhydrous acetonitrile or tetrahydrofurane to the solution to flocculate the nanocrystals. Transfer the suspension to a vial in the glove box, close the vial with a cap, and centrifuge for 15 min (4226 x g). Decant the solution. Discard the supernatant and wash the precipitate with anhydrous acetonitrile or tetrahydrofurane. Obtain the particles as a sticky powder containing the Pt/Sn nanoparticles in addition to some residual IL. where Lhkl is the diameter (nm) of the Pd/Sn nanocrystal perpendicular to hkl, λ the wavelength (nm) (typically Cu Kα 0.154 nm), β the peak width at half maximum, and θ the Bragg angle. Determine the metal content and the composition by ICP-AES. NOTE: The composition of the particles can be tuned by changing both the nature of the metal precursors and the platinum to tin precursor ratio. 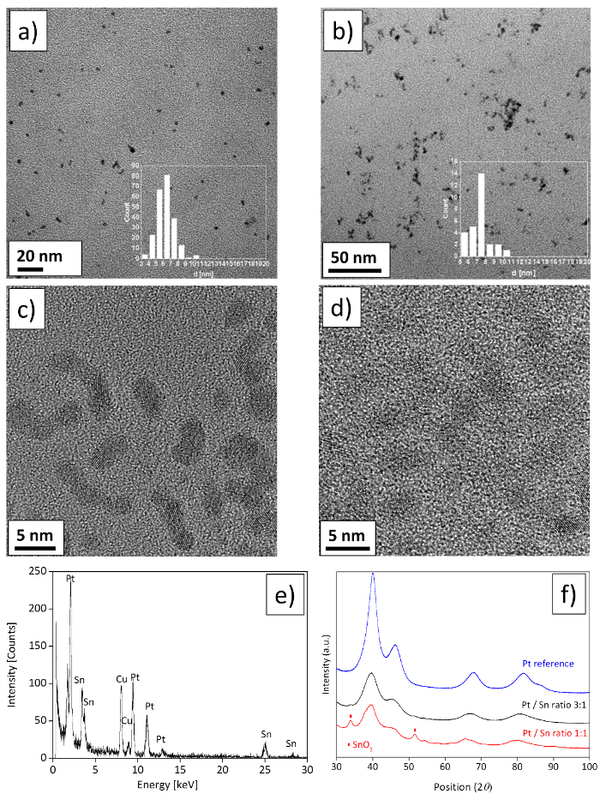 Pt/Sn-based nanoparticles synthesized from platinum(II) chloride (PtCl2) and tin(II) acetate (Sn(ac)2) (Pt:Sn precursor ratio of 3:1 or 1:1), yield random alloy-type Pt/Sn nanoparticles. See reference for details [C. Dietrich, D. Schild, W. Wang, C. Kübel, S. Behrens, Z. Anorg. Allg. Chem. 2017, 643, 120-129]25. NOTE: To transfer the nanoparticles from the IL into a conventional organic solvent (i.e., n-hexane), add 2 mL N-oleylsarcosine (10 wt.-% in hexane) and 2 mL of acetonitrile to 1 mL of the nanoparticle sol in the IL. Add 2 mL N-oleylesarcosine in n-hexane (10 wt.-%) and 1 mL of anhydrous acetonitrile to the nanoparticle/IL sol to extract the nanocrystals in n-hexane. After shaking, monitor the phase transfer visually by both the decolorization of the IL phase and a black coloring of the n-hexane phase. Deposit a drop of the solution on a carbon-covered copper grid and analyze by transmission electron microscopy. NOTE: For catalytic testing, use a semi-continuous autoclave reactor with a reactor equipped with a Teflon liner, a mechanical blowing stirrer (Teflon) and baffles (stainless steel) to achieve intimate mixing between the gas and the liquid phase, a thermocouple and a heating bath. Add 2.2 mg (17 mmol) of cinnaic aldehyde (CAL) in 30 mL of anhydrous tetrahydrofurane under inert gas. In the anoxic glove box, combine with 1 mL of the nanoparticle solution. Place the reactor in the heating bath and pressurize with hydrogen. During catalytic experiments, keep the hydrogen pressure constant at 10 bar, while hydrogen is continuously supplied to the reactor via a 500 mL gas burette. Raise the temperature to 80 °C. At 80°C, start to stir using a blowing stirrer (1200 rpm). Load the reactor with hydrogen to start the reaction. Record the hydrogen consumption continuously based on the pressure drop in the gas burette. To determine catalytic activity and selectivity, take aliquots every 30 min. Analyze the reaction products by gas chromatography using a column (30m x 0.25mm, 0.25µm film thickness). where t is the reaction time (h), n0,CAL the initial amount of CAL (mol), nmetal/catalyst the amount of metal catalyst (mol), and Xt,CAL the conversion of CAL at time t (%). [CAOL], [HCAOL] and [HCAL] refer to the concentrations of cinnamic alcohol, hydrocinnamic alcohol and hydrocinnamic aldehyde (see reaction scheme Figure 2), respectively. NOTE: For more details, also see reference 25. XRD patterns and transmission electron microscopy (TEM) images are collected for the alloyed nanoparticles (Figure 1) and used to identify the size, phase and morphology of the nanostructures. Energy-dispersive X-ray spectroscopy (EDX) and ICP-AES are used to determine the elemental composition of the nanoparticles. Figure 1. Representative TEM images with particle size distribution of random alloy-type Pt/Sn nanoparticles. The nanoparticles were prepared using platinum(II) chloride and tin(II) acetate precursors (a) in a molar Pt:Sn precursor ratio of 3:1 and (b,c) in a molar Pt:Sn precursor ratio of 1:1 and (d) using platinum(II) chloride and tin(II) chloride precursors in a molar Pt:Sn ratio of 1:1. (e) Representative energy-dispersive X-ray spectrum of the bimetallic Pt/Sn-based particles confirming the presence of both Sn and Pt. (Cu signals originate from the supporting Cu grid). (f) XRD patterns of Pt/Sn-based nanoparticles compared to Pt nanoparticle reference. Please click here to view a larger version of this figure. Figure 2. Schematic representation of the reaction pathways and major reaction products (i.e., cinnamic alcohol (CAOL), hydrocinnamic aldehyde (HCAL), and hydrocinnamic alcohol (HCAOL)) in the hydrogenation of cinnamic aldehyde (CAL). The selective hydrogenation of the carbonyl bond to the unsaturated alcohol is a critical step in the synthesis of various fine chemicals. By alloying Pt with Sn in Pt/Sn-based nanoparticles, the carbonyl bond may be selectively hydrogenated to yield the unsaturated alcohol (i.e., CAOL) as the main reaction product. Please click here to view a larger version of this figure. Figure 3. Time course of the conversion and selectivity in the catalytic hydrogenation of cinnamaldehyde (CAL) for the random alloy-type Pt/Sn nanoparticles which are prepared from platinum(II) chloride and tin(II) acetate in a Pt:Sn precursor ratio of (a) 1:1 and (b) 3:1 (reaction conditions: 80 °C, 10 bar H2). Although the CAOL selectivity is lower for nanoparticles with a Pt:Sn precursor ratio of 3:1 (b), the enhanced CAL conversion results in a higher yield in CAOL. Please click here to view a larger version of this figure. The metal salt precursors are carefully dissolved in [OMA][NTf2] by stirring the reaction mixture over night, followed by ultrasonication. This is an important step to achieve Pt/Sn nanoparticles of homogeneous composition and sizes. [OMA][BEt3H] (as a solution in tetrahydrofurane) is then rapidly injected with a syringe whilst vigorously stirring the viscous solution. Rapid injection and mixing of the two components is a prerequisite to achieve monodisperse and homogeneous nanoparticles and may limit the scale-up of the procedure. Successful nanoparticle formation may be monitored by the change in color from a yellowish to black solution. During this step, H2 is generated as a side product, and thus, the reduction step has to be performed in an argon stream to avoid pressurization of the reaction vessel. Contact with air and moisture has to be prevented during all steps of nanoparticle synthesis. The Pt/Sn nanoparticles are formed in the IL after the injection of the reducing agent, where IL cation and IL anion control both nucleation and growth processes25. As a result, very small nanoparticles are obtained which form an extraordinarily stable, colloidal sol in [OMA][NTf2]. This synthetic approach does not require the use of additional, strongly coordinating ligands and may be further employed to achieve small nanoparticles of various mono- and bimetallic compositions. The sols in which the nanoparticles are immobilized in the IL are highly interesting in view of quasi-homogeneous catalytic applications. However, the isolation of the nanoparticles (e.g., for particle characterization) turns out to be quite challenging due to the high colloidal stability in the IL. The particles are isolated as a sticky powder by precipitation with tetrahydrofurane and successive centrifugation. This is a useful step with respect to nanoparticle characterization, e.g., by TEM or XRD analysis. Alternatively, the nanoparticles can be additionally functionalized and extracted to a conventional solvent, after adding a coordinating ligand (i.e., N-oleylsarcosine) in n-hexane and acetonitrile to the IL-based nanoparticle sol. The samples are then further treated like a conventional nanoparticle sol. In general, specific surface properties are typically required with respect to a certain biomedical or technical application of the nanoparticles. Due to the weak coordination of the particles to the surface, ILs can be replaced by other ligands easily. As a consequence, it's possible to engineer the surface properties based on the specific requirements of the application using the present synthetic procedure. Magnetic fluids based on small, superparamagnetic cobalt nanoparticles, e.g., are prepared in diverse aliphatic or aromatic carrier media (i.e., kerosene, AP201, or Edwards L9) following a similar procedure3,4. After nanoparticle extraction, the IL may be recycled and reused for nanoparticle synthesis. TEM analysis of the particles is carried out by depositing a thin film of the nanoparticle sol on the TEM grid. Here, the decomposition of the IL in the electron beam and successive contamination of the TEM sample may represent a real challenge to image the small nanoparticles. Alternatively, the precipitated nanoparticles are deposited on the TEM grid and investigated by TEM analysis. In this case, the particles typically form highly aggregated structures. Figure 1a-d displays TEM images of the nanoparticles in the IL showing very small and regular nanoparticles of 2-3 nm diameter. For all samples, TEM-EDX analysis confirms the presence of both tin and platinum in the particles (Figure 1e). In order to show the alloyed character and the random alloy-type structure of the nanoparticles, X-ray diffraction patterns are collected for the nanoparticle powders. The XRD patterns confirm the face centered cubic (fcc) and random alloy-type structure of the particles (Figure 1f). The random alloy structure is one of the most conventional forms in bimetallic nanoparticles, where the two elements are randomly (or nearly randomly) dispersed in the nanoparticles. For the Pt-Sn system, also the formation of some intermetallic compounds is known (i.e., PtSn, PtSn4, PtSn2, Pt2Sn3, and Pt3Sn)17,26. Ordered intermetallic and disordered random alloy structures may be distinguished by the presence and absence of additional diffraction patterns derived from superlattice structures. The fcc platinum phase has reflections at 40°, 45°, 68°, and 82° (2) corresponding to the (111), (200), (220), and (311) planes. For all Pt/Sn-based nanoparticles, the XRD pattern shows the four characteristic reflections of the fcc platinum phase. As compared to the positions of the reflections of the pure platinum reference, however, the reflections of the Pt/Sn-based nanoparticles are shifted to smaller Bragg angles. This shift to smaller Bragg angles indicates an increase of the lattice parameters by the insertion of the tin atoms into the fcc platinum lattice. In the XRD patterns, the reflections which are characteristic of the atomic ordering in the intermetallic phase (i.e., Pt3Sn) are not observed. This suggests the formation of an alloyed nanoparticle core with a random distribution of platinum and tin. The decrease of the PdCl2 to Sn(ac)2 precursor ratio from 3:1 to 1:1 additionally leads to small SnO2 nanoparticles in close contact to the random alloy-type Pt/Sn nanoparticles. SnO2 is formed by decomposition of the Sn(ac)2 precursor. If Sn(ac)2 is reacted with [OMA][BEt3H] under the same reaction conditions in the absence of the platinum precursor, SnO and SnO2 are obtained as major reaction products. If the Sn(ac)2 is replaced by tin(II)chloride (SnCl2) and reacted with [OMA][BEt3H] in the presence of the platinum precursor (PtCl2), exclusively amorphous particles are formed and no SnO2 is detected. The tin content in the nanoparticle core can be further analyzed if the lattice constants are determined via Rietveld analysis. According to Vegard's law, the lattice parameters increase linearly between the lattice parameters of the pure Pt nanoparticles (3.914 Å) and the Pt3Sn phase (4.004 Å). Following this approach, the tin in the crystalline nanoparticle core is calculated to 11% (i.e., for a PtCl2 / Sn(ac)2 precursor ratio of 3:1) and increases to 18 % (i.e., for a PtCl2 / Sn(ac)2 precursor ratio of 1:1). The overall tin content of 21% and 55%, respectively, is determined by ICP-AES analysis and thus, exceeds the amount of tin in the nanoparticle core. The higher overall tin content can be assigned to the additional formation of SnO2 (i.e., approximately 26%) and to some segregation of tin atoms on the nanoparticle surface. X-ray photoelectron spectra further confirm the presence of Pt0/Sn0 (i.e., for a PtCl2 to Sn(ac)2 precursor ratio of 3:1) and Pt0/Sn0 in combination with 20% SnO2 (i.e., for a PtCl2 to Sn(ac)2 precursor ratio of 1:1) in the Pt/Sn-based nanoparticles, which is consistent with the results of XRD analysis25. The peak broadening arises from Scherrer broadening due to finite crystal size. The size of the nanoparticles is calculated using the Scherrer equation for the Pt/Sn-based nanoparticles to 2.4 nm (i.e., Pt:Sn 1:1), 2.5 nm (i.e., Pt:Sn 3:1) and, for the Pt nanoparticle reference, to 2.7 nm, respectively, which is consistent with the results of TEM analysis. The transformation of α,β-unsaturated aldehydes to unsaturated alcohols via selective hydrogenation is fundamental in catalytic chemistry and a critical step in the production of various fine chemicals25,27. Although thermodynamics favors the formation of the saturated aldehydes, the selectivity towards the formation of the unsaturated alcohols can be significantly increased on bimetallic Pt-based catalysts by tailoring their size, composition and their support material. The incorporation of an electropositive metal (e.g., Sn) into the platinum leads to the electronic modification of the Pt d band which lowers the binding energy for the C=C bond of the unsaturated aldehyde27. The electron-deficient Sn atoms may further act as Lewis acid adsorption sites for the carbonyl group28. Moreover, vacant oxygen sites in SnO2-x patches in close contact to Pt are also demonstrated to promote carbonyl adsorption and its subsequent hydrogenation by atomic hydrogen which is supplied via the nearby platinum sites29. Overall, these examples show that the catalytic performance of bimetallic Pt-based catalysts is governed by a complex set of factors. In this protocol, we use the hydrogenation of cinnamic aldehyde as a model reaction not only to probe the overall catalytic performance of the IL-stabilized nanoparticles but further to elucidate the effect of tin alloying on the activity and selectivity of the Pt nanoparticles. Figure 2 displays possible pathways and major reaction products in the hydrogenation of CAL. At first, the catalytic properties of the Pt reference nanoparticles are tested in the hydrogenation of CAL. In this case, the saturated aldehyde (i.e., HCAL) is obtained as the only reaction product after 3 h of reaction, and the CAL conversion XCAL is 5% (3 h) and 9% (22 h), accordingly. After alloying the Pt with Sn in the bimetallic nanoparticles, the product selectivity is clearly shifted towards the unsaturated alcohol (i.e., CAOL) (Figure 3). The selectivity SCAOL is 100 % (i.e., for particles synthesized by a molar PtCl2/Sn(ac)2 ratio of 1:1), 80 % (i.e., for particles synthesized by a molar PtCl2 / Sn(ac)2 ratio of 3:1), and 83 % (i.e., for particles synthesized by a molar PtCl2 / SnCl2 ratio of 1:1) after 3 h of reaction and thus, further influenced by the actual nanoparticle composition. The TOF decrease from 28 h-1 to 8 h-1 for the particles synthesized by a molar PtCl2 / Sn(ac)2 ratio of 3:1 and 1:1, respectively, and to 7 h-1 for the nanoparticles obtained using SnCl2 instead of Sn(ac)2 with a molar PtCl2/SnCl2 ratio of 1:1, accordingly. The CAL conversion XCAL is 25% (3h) and 84% (22h) for Pt/Sn-based nanoparticles (i.e., molar PtCl2 / Sn(ac)2 ratio 3:1) which leads to the highest yield in CAOL (YCAOL 20% (3 h)) among the nanoparticles investigated in this study. In order to evaluate the overall catalytic performance of the system, both aspects, i.e., catalytic selectivity and activity, need to be taken into account and thus, Pt/Sn nanoparticles prepared with an initial molar PtCl2/Sn(ac)2 ratio of 3:1 clearly outperformed all other Pt- and Pt/Sn-based particles investigated in our study in terms of cinnamic alcohol yield. Thus, the excellent catalytic performance in this case appears to be a consequence of the Sn doping of the Pt nanoparticles balancing activity and selectivity to cinnamic alcohol in the system. It has to be noted that the blank experiment using the same reaction conditions but without nanoparticle catalyst did not show any conversion of cinnamic aldehyde after 22 h of reaction. We have demonstrated a synthetic procedure for controlling the preparation of small, Pt/Sn-based nanoparticles of random alloy-type structure by exploiting the beneficial physico-chemical properties of ILs. Similar co-precipitation approaches have already been applied to a wide range of bimetallic nanoparticles in conventional solvents, and we expect that the types of both random alloy and intermetallic nanoparticles that can be obtained by this approach will continue to expand. The nanoparticles reveal interesting catalytic properties in the catalytic hydrogenation of cinnamic aldehyde, and a significantly higher selectivity to the α,β-unsaturated cinnamic alcohol is achieved for the Pt/Sn-based nanoparticles. This work was supported by the German Science Foundation within the Priority Program (SPP1708) "Material Synthesis near Room Temperature" (projects BE 2243/3-1 and BE 2243/3-2). We further acknowledge Hermann Köhler for experimental assistance as well as Dr. Christian Kübel and Wu Wang for support with electron microscopy studies. Dupont, J., Scholten, J. D. On the structural and surface properties of transition-metal nanoparticles in ionic liquids. Chemical Society Reviews. 39, (5), 1780-1804 (2010). Vollmer, C., Janiak, C. Naked metal nanoparticles from metal carbonyls in ionic liquids: Easy synthesis and stabilization. Coordination Chemistry Reviews. 255, (17-18), 2039-2057 (2011). Behrens, S., Essig, S. A facile procedure for magnetic fluids using room temperature ionic liquids. Journal of Materials Chemistry. 22, (9), 3811-3816 (2012). Essig, S., Behrens, S. Ionic liquids as size- and shape-regulating solvents for the synthesis of cobalt nanoparticles. Chemie Ingenieur Technik. 87, (12), 1741-1747 (2015). Liu, X., Wang, D., Li, Y. Synthesis and catalytic properties of bimetallic nanomaterials with various architectures. Nano Today. 7, 448-466 (2012). Armbrüster, M. K., et al. Al13Fe4 as a low-cost alternative for palladium in heterogeneous hydrogenation. Nature Materials. 11, 690-692 (2012). Luo, Y., Alarcón Villaseca, S., Friedrich, M., Teschner, D., Knop-Gericke, A., Armbrüster, M. Addressing electronic effects in the semi-hydrogenation of ethyne by InPd2 and intermetallic Ga-Pd compounds. Journal of Catalysis. 338, 265-272 (2016). Egeberg, A., et al. Bimetallic nickel-iridium and nickel-osmium alloy nanoparticles and their catalytic performance in hydrogenation Reactions. ChemCatChem. 9, 3534-3543 (2017). Rai, R., et al. Access to highly active Ni-Pd bimetallic nanoparticle catalysts for C-C coupling reactions. Catalysis Science & Technoly. 6, 5567-5579 (2016). Rai, R., Gupta, K., Behrens, S., Li, J., Xu, Q., Singh, S. K. Highly active bimetallic nickel-palladium alloy nanoparticle catalyzed Suzuki-Miyaura reactions. ChemCatChem. 7, 1806-1812 (2015). Singh, S. K., Yadav, M., Behrens, S., Roesky, P. W. Au-based bimetallic nanoparticles for the intramolecular aminoalkene hydroamination. Dalton Transactions. 42, 10404-10408 (2013). Arquillière, P., et al. Bimetallic Ru-Cu nanoparticles synthesized in ionic liquids: Kinetically controlled size and structure. Topics in Catalysis. 56, 1-7 (2013). Helgadottir, I., et al. Ru-core/Cu-shell bimetallic nanoparticles with controlled size formed in one-pot synthesis. Nanoscale. 6, 14856-14862 (2014). Dash, P., Miller, S. M., Scott, R. W. J. Stabilizing nanoparticle catalysts in imidazolium-based ionic liquids: A comparative study. Journal of Molecular Catalysis A. 329, 86-95 (2010). Schutte, K., et al. Colloidal nickel/gallium nanoalloys obtained from organometallic precursors in conventional organic solvents and in ionic liquids: noble-metal-free alkyne semihydrogenation catalysts. Nanoscale. 6, 5532-5544 (2014). Schutte, K., Meyer, H., Gemel, C., Barthel, J., Fischer, R. A., Janiak, C. Synthesis of Cu, Zn and Cu/Zn brass alloy nanoparticles from metal amidinate precursors in ionic liquids or propylene carbonate with relevance to methanol synthesis. Nanoscale. 6, 3116-3126 (2014). Wang, X., et al. Pt/Sn Intermetallic, Core/Shell and Alloy Nanoparticles: Colloidal Synthesis and Structural Control. Chemistry of Materials. 25, 1400-1407 (2013). Marcos Esteban, R., Janiak, C. Synthesis and application of metal nanoparticle catalysts in ionic liquid media using metal carbonyl complexes as precursors. Nanocatalysis in Ionic Liquids. Prechtl, M. Wiley-VCH, Weinheim. (2016). Redel, E., Krämer, J., Thomann, R., Janiak, C. Synthesis of Co, Rh and Ir nanoparticles from metal carbonyls in ionic liquids and their use as biphasic liquid-liquid hydrogenation nanocatalysts for cyclohexene. Journal of Organometallic Chemistry. 694, 1069-1075 (2009). Venkatesan, R., Prechtl, M. H. G., Scholten, J. D., Pezzi, R. P., Machado, G., Dupont, J. Palladium nanoparticle catalysts in ionic liquids: synthesis, characterisation and selective partial hydrogenation of alkynes to Z-alkenes. Journal of Materials Chemistry. 21, 3030-3036 (2011). Konnerth, H., Prechtl, M. H. G. Selective partial hydrogenation of alkynes to (Z)-alkenes with ionic liquid-doped nickel nanocatalysts at near ambient conditions. Chemical Communications. 52, 9129-9132 (2016). Gieshoff, T. N., Welther, A., Kessler, M. T., Prechtl, M. H. G. Stereoselective iron-catalyzed alkyne hydrogenation in ionic liquids. Chem. Comm. 50, 2261-2264 (2014). Konnerth, H., Prechtl, M. Selective hydrogenation of N-heterocyclic compounds using Ru nanocatalysts in ionic liquids. Green Chemistry. 19, 2762-2767 (2017). Beier, M. J., Andanson, J. -M., Mallat, T., Krumeich, F., Baiker, A. Ionic liquid-supported Pt nanoparticles as catalysts for enantioselective hydrogenation. ACS Catalysis. 2, 337-340 (2012). Dietrich, C., Schild, D., Wang, W., Kübel, C., Behrens, S. Bimetallic Pt/Sn-based nanoparticles in ionic liquids as nanocatalysts for the selective hydrogenation of cinnamaldehyde. Journal of Inorganic and General Chemistry (ZAAC). 643, 120-129 (2017). Zhou, W., Liu, L., Li, B., Wu, P., Song, Q. Structural, elastic and electronic properties of intermetallics in the Pt-Sn system: A density functional investigation. Computational Materials Science. 46, 921-931 (2009). Gallezot, P., Richard, D. Selective hydrogenation of α,β-unsaturated aldehydes. Catalysis Reviews Science and Engineering. 40, 81-126 (1998). Samant, P., Pereira, M., Figueiredo, J. Mesoporous carbon supported Pt and Pt-Sn catalysts for hydrogenation of cinnamaldehyde. Catal. Today. 102, 183-188 (2005). Rong, H., et al. Structure evolution and associated catalytic properties of Pt-Sn bimetallic nanoparticles. Chemistry European Journal. 21, 12034-12041 (2015).